We are having such a blast with our Girl Power series! It's been great to hear from Maria Selke, Kirby Larson, Jenni Holm, and Kristin Levine already! Authors have many different reasons for making sure to include strong girl characters in their writing and have different female characters that they think of as exemplars of strong protagonists. Today, we have J.E. 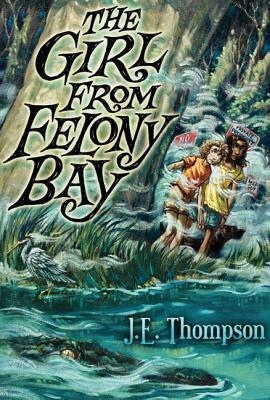 Thomspon, the author of The Girl of Felony Bay, as a guest blogger to share with us why he includes strong female characters and how these female characters can play a major role in literature. I believe strong female characters in books may be lifesavers for girls who have no other examples of strength, courage and integrity in their own lives. They also provide reinforcement to other girls by showing them role models they can use to re-imagine how they would like to act and react in their own lives. Strong female characters in books don’t hold back; they throw themselves into the action. They are dynamic, clever and intrepid. They make mistakes, but they learn from their mistakes and grow from them and move forward. They are formidable. Strong female characters show girls that they can be strong without being harsh, stand up for themselves without being bossy or prudish, be smart without being nerds, be outspoken when they know they are right and be leaders of the group just as readily as any boy. Some of the obvious female characters that jump to mind are Katniss Everdeen from THE HUNGER GAMES and Hermione Granger from HARRY POTTER. They are smart, strong, brave and intrepid, wonderful female characters who don’t sacrifice a bit of their loveliness but who manage to be heroines at the same time. However, there are also female characters who aren’t powerful in a physical sense. Remember Hazel Lancaster in THE FAULT IN OUR STARS, who drags an oxygen bottle around on a cart because her cancer-riddled lungs no longer function well enough for her to breathe on her own, but who embodies such tremendous courage, intelligence and integrity and who finds the courage to love and let herself be loved in spite of her totally hopeless circumstances. Other wonderful female characters include June Iparis the courageous and brilliant 15 year-old heroine of LEGEND, who struggles to unearth the ugly truths about her society that force her to become a rebel. There is also Beatrice Prior in DIVERGENT who learns the risks and strengths that come from being different from others, in other words the risks from being divergent. All of these female characters defend their sense of right and wrong; they face their fears; they do what they are convinced is right in spite of opposition from other people, their society or their own internal fears. In spite of the great difficulties each of them faces in their personal struggle, they are each reinforced and strengthened by their courage and their determination to prevail in whatever way they can. None of them are passive. None allow the world to consign them to a predetermined fate or role. Each of them is dynamic, reactive and each shapes the world around her through her own determination. These are EXACTLY the kind of women I want my daughters to look up to. It is so important to remember that strength isn't just physical! We must show our girl readers that woman can be strong in all sense of the word. Thank you J.E. for taking part in our Girl Power series!